We are still at the University and Howard and Leonard are still surrounding Missy. They want to know what brought her to town from Texas; Howard is pretty sure it is destiny. Missy says she is here for a wedding and to have Shelly sign some papers. Shelly says that is just a ruse for Missy to check on him for their mother. After giving his sister his weight and the information his bowel movements are regular he says good-bye. Leonard invites her to stay with them and Missy explains that Sheldon use to not even let his imaginary friends spend the night. 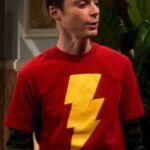 Sheldon corrects her that they are not friends but imaginary colleagues. Howard calls him Shelly and helps Leonard insist that Missy stay. Sheldon tells Howard to never call him Shelly and all of the sudden Missy is staying and Sheldon is not sure what just happened (awh, poor Shelly). Missy is telling stories about Sheldon’s youth, while Leonard and Howard sit laughing and nodding. Penny knocks and walks in with a pair of Superman undies that she thinks are Leonard’s. Leonard gets embarrassed. He then introduces Penny to Missy. Sheldon explains about fraternal twins and Howard puts his hands up and says Hallelujah. Raj runs in and in front of the ladies says he has been accepted into a test for a miracle drug to help overcome pathological shyness. Penny is proud of him. Raj says hello to Missy and waves and his hands keeps making circles, he says they did mention there might be side effects. Raj is now sitting next to Missy asking if she has ever met a man from India and she says yes there is Dr Patel at her Church. Raj and Howard start to get in a nerd match over her. Penny wants to know why Sheldon is ignoring his sister. Sheldon says he is not he is ignoring all of them. Raj says his people invented PJ’s and Howard says his people invented circumcision. Penny intervenes, she asks Missy if she would like to go get her nails done and Missy jumps at the chance, making it clear the guys are freaking her out. The girls leave. Howard tells Raj and Leonard to back off. Leonard wants to know why he should back off and Howard responds because he has Penny. Leonard wants to know in what world he has Penny and goes on a little about that. Howard pauses after Leonard’s tirade about not having Penny and wants to know if he can have Penny. To which Leonard shouts a loud NO. At this point Sheldon interrupts because he is ordering pizza online and wants to know if everyone is ok with pepperoni. Leonard wants to talk to Sheldon in private. They go into what I think is Leonard’s bedroom. Leonard wants to know if Sheldon understands how beautiful his sister is. Leonard asks if Sheldon has considered that it is his job to help Missy find a mate. 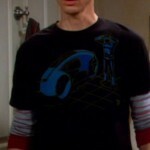 Sheldon realizes that he is the man of his family and that he should help Missy find the best mate. We pan to Raj and Howard wrestling on the floor. Sheldon tells all three of the guys are out. Raj is smiling HUGE and Howard wants to know why Raj is so happy. Raj says he is not, it’s the new medicine and then his hand starts turning over and over. The guys are gathered around the kitchen island in the apartment. Sheldon is making a sandwich. He mentions that Leonard was the one to clue him in to how high the genetic stakes are, after all Missy could produce the Sheldon 2.0. Howard with a frozen bag of peas to his neck wants to know if it was really Leonard that pointed out this fact. Leonard tries to blow it off. Raj points out that genetic diversity is important. Sheldon points out that it takes experimental pharmaceuticals for Raj to be able to talk and Raj is out. Raj finger keeps shaking and Leonard has to push it to stop it. Howard wants to know if Sheldon is questioning him because he is Jewish, because he would “Kill his Rabbi with a pork chop to be with Sheldon’s sister. “ Sheldon gives him a look, and explains that it has nothing to do with his religion but Howard is a tiny, tiny man who lives with his mother. And if Leonard can eat this piece of cheese with out passing gas, he can marry Missy and in walks Missy and Penny. Missy takes Sheldon into Shelly’s room. Sheldon explains that he is a superior genetic mutation and residing in Missy is the means to make a Sheldon 2.0. Shelly explains that Missy will have some input on her suitor. Missy makes Shelly sit and explains that if he tries to tell her whom to sleep with they will go round and round like when they were little. Sheldon immediately crosses his legs. Sheldon tries to give an alternate idea. We then see Sheldon walking into the living room cupping himself and stating that Missy can date whom ever she wants. The guys decide they need to settle this and Leonard says Missy is hiding at Penny’s because they are driving her nuts. They decide to settle this like men and the camera turns to boxing on the Wii. Leonard wins and we see him strutting across the hall. He knocks on Penny’s door and she answers after asking if she is still dating Mike, she is, he wants to know if he can talk to Missy. Leonard wants to know if Missy wants to go to dinner. She turns him down. Howard is up next. He wants to know if she likes magic, Missy doesn’t like magic. Howard does his magic trick, kind of turns a cane into a cloth that says will you go out with me. Missy says no, Howard says ok, then pulls out a handkerchief that says “Are you sure” she does not even answer and closes the door in his face. Raj comes over and loses his ability to speak; Missy says she was hoping Raj would show up. He makes some high-pitched noises, turns and walks down the stairs. Sheldon and Missy are walking out. They hug or Missy hugs Sheldon and he pats her.